We are studying the effects of a magneto-optical phenomenon known as Faraday rotation. 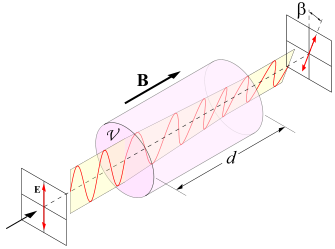 In essence, we are passing a beam of polarized light through a small container of gold nanoparticles, applying a powerful magnetic field, and observing how much that beam of light is "twisted" as it exits through the other side. Faraday rotation was discovered by Michael Faraday in 1845 and was the first experiment whose evidence suggested that light and electromagnetism are related. The amount of rotation we see is dependent on many factors such as the strength of the magnetic field, the physical length the light travels through the solution, and the concentration of atoms in the nanoparticle solution. Many materials have the ability to induce Faraday rotation (including water), but gold in particular is interesting because of its unique atomic and optical properties. Specifically, we can create propogating plasma waves on the surface of these nanoparticles when they are excited resonantly by incoming electromagnetic radiation. My name is Christopher Ramirez and as of Fall 2013, I will be a senior at the University of Texas at El Paso. I am an undergraduate physics major and have plans to continue my education so that I may one day be an aerospace engineer. This REU is the very first chance I've had to do actual research, and I am very excited to have been given the opportunity to participate. In general, my life back home in El Paso Texas can be quite hectic and tumultuous, but I make an effort to balance work and school with play. Nobody wants to burn out from stress! I enjoy cycling around the wide, flat areas of western Texas, even if the brutal sun gives me occasional sunburns. I am part of my university's Socierty of Physics Students chapter, and deeply enjoy attending the physics circuses we provide. In addition, I've held many jobs over the course of my college career, including being a physics tutor to undergraduates and bartending at a local four-star hotel. I do not live at home with my parents and am completely responsible for all my bills and duties. Although this way of life is oftentimes stressful, I enjoy the sense of freedom that comes with it. This program is generously funded by the National Science Foundation through grant number [PHY-1157044]. Any opinions, findings, and conclusions or recommendations expressed in this material are those of the author(s) and do not necessarily reflect the views of the National Science Foundation.